Description: Arctic terns are pale grey with paler underparts and a white rump and tail. The crown and forehead are black with a small white area on their cheeks. They have grey wings with a narrow black line along the tips and long tail streamers. In breeding season adult Arctic terns have red bills, legs and webbed feet while out of breeding season they are blackish. Juveniles have darker upperparts and brown-tipped feathers on the mantle and inner wings and pink bills, legs and feet. Nesting: Arctic terns nest in colonies and will return to the same breeding grounds each year. Their build their nest in a hollow in the ground in short grasses, sand or gravel away from water. They lay 1-3 eggs, which are pale olive in colour with darker markings that camouflage them well against the ground. Both male and female Arctic terns will sit on the nest. Eggs are incubated for about 25 days and chicks will fledge at about 21 days. Although juvenile Arctic terns will learn to feed themselves independently of their parents after a month they will fly south to winter with the help of their parents. Feeding: Arctic terns feeds mainly on small fish but will also eat crustaceans, molluscs and insects. On land they will feed on caterpillars and worms and occasionally berries in early spring. 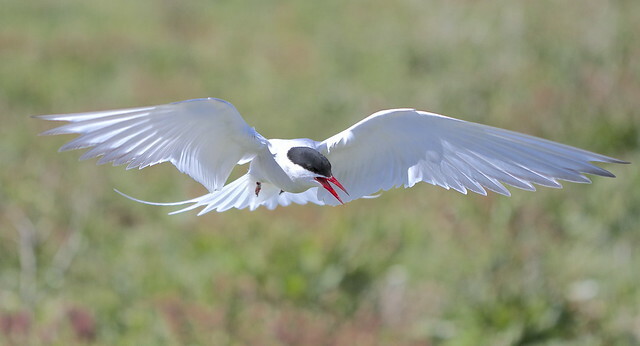 Where to see them: Breeding Arctic terns can be found in Northern England, Scotland and north Wales mainly on islands such as the Farne Islands or the Northern Isles. During the spring passage they can also be seen on inland reservoirs. European visitors start to arrive back from the Antarctic in May with northernmost birds getting back in June. They will start their migration south in late July and August. Did you know? Arctic terns make the longest migrations of any bird travelling about 70 km a year which adds up to an impressive 2.4 million km over its lifetime.